The Martin J. Whitman School of Management has been ranked #2 by Military Times in its 2015 list of Best for Vets: Business Schools, the publication announced today. Best for Vets provides men and women a gauge by which to judge whether a school or program will truly benefit them. The rankings factor in academic quality, outcomes and policies, school culture, student support and cost. 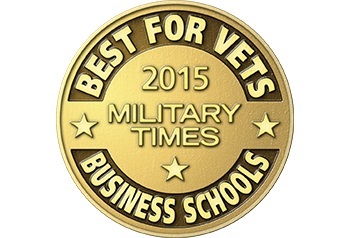 For the full Best for Vets: Business Schools 2015 rankings, visit www.militarytimes.com/bestforvets-bizschools2015. Since 1952, Whitman has offered educational programs serving military members and veterans. “Our more than 60-year collaboration with the Department of Defense (DoD) in the delivery of financial management education to military and DOD civilians has been a privilege, and we look forward to many more years of partnership in preparing our future leaders,” said Irma P. Finocchiaro, director of executive education and defense programs at the Whitman School. One of the Whitman School’s newest offerings, MBA@Syracuse, is a newly revamped online MBA program, which is proving popular among active military personnel, as well as veterans. Additional educational opportunities for military and civilian personnel at Whitman include the Defense Comptrollership Program (DCP) in which more than 1,600 military and civilian personnel have attended, and the LOGTECH iMS, a Master of Science degree in supply chain management. The Whitman School also offers an accelerated M.B.A. for Veterans program (54 credits spanning a 14-month period) that helps students gain expertise in an area of entrepreneurship that is most related to their field of leadership and innovation, and the school offers short courses, as well, including the Army Comptroller Course (ACC), the Executive Comptroller Course (ECC), the Senior Resource Managers Course (SRMC) and Army Financial Management 101.